Carmageddon | Where's my backpack? 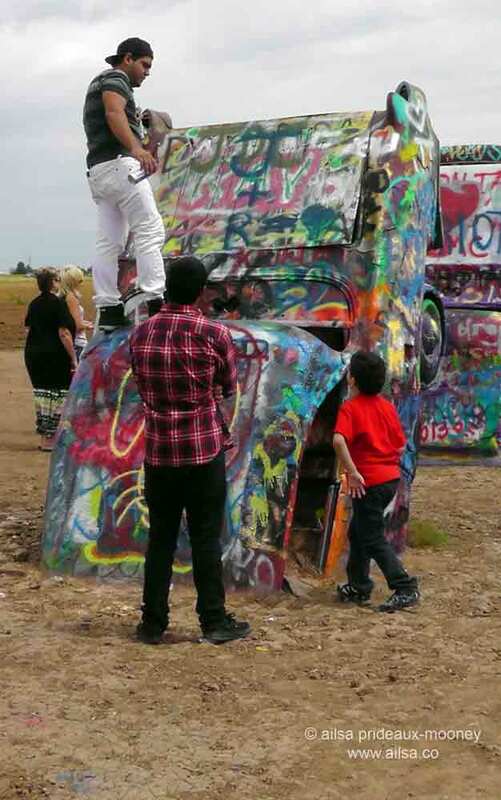 Just outside of Amarillo’s city limits, west along the grand old Mother Road, lies one of those roadside attractions you just don’t want to miss. 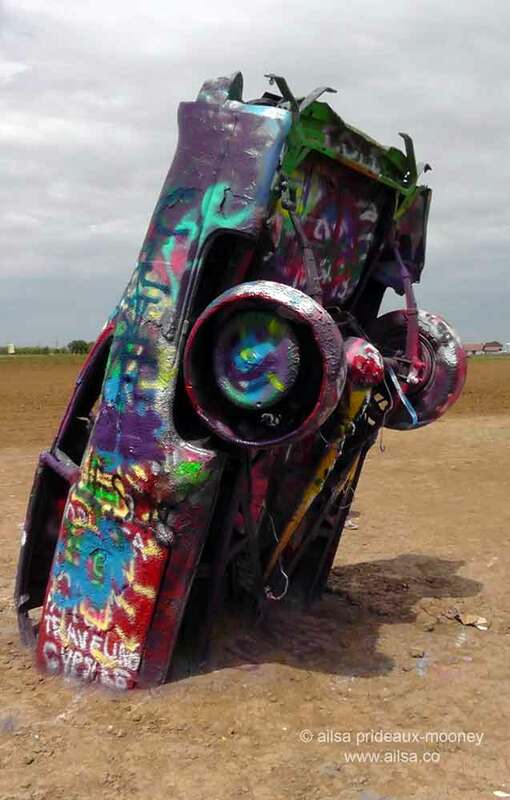 Cadillac Ranch is an art installation that was created in 1974 by a San Fransiscan artists’ collective called The Ant Farm. 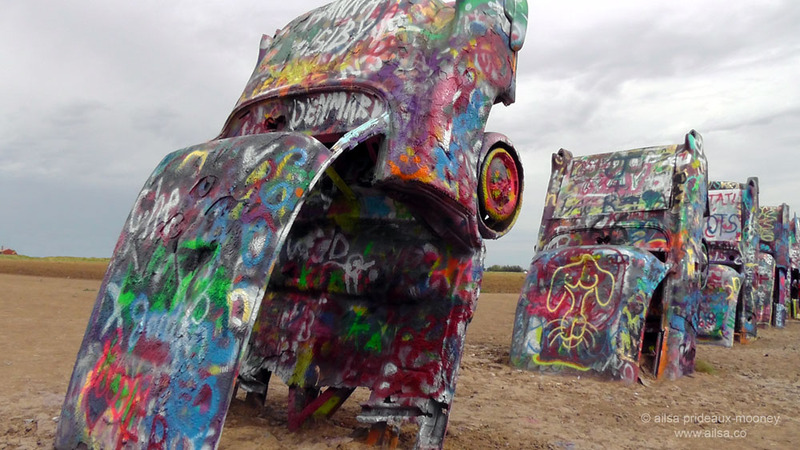 Despite its relative ‘newness’ compared to other Route 66 attractions that date back much closer to the road’s inception in 1926, this quirky slice of Americana perfectly encapsulates the spirit of freedom that this legendary road has come to represent. 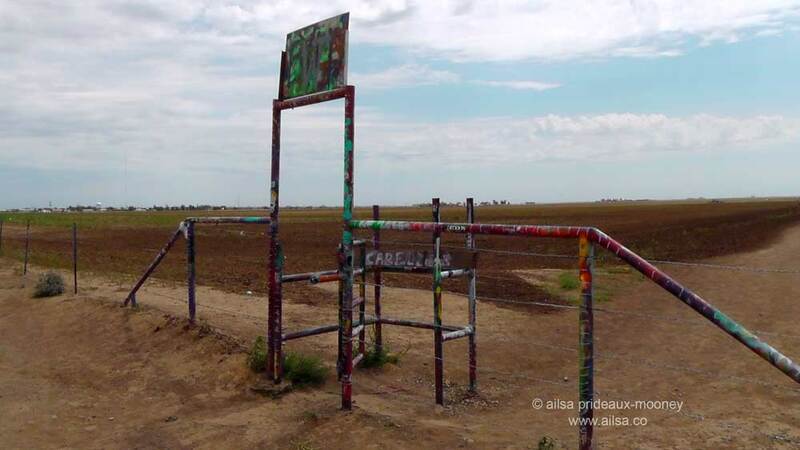 Keep your eyes peeled as you leave town, because you can’t access the ranch from the current highway; you have to turn off onto the southern Frontage Road that runs parallel to the highway, headed eastbound. 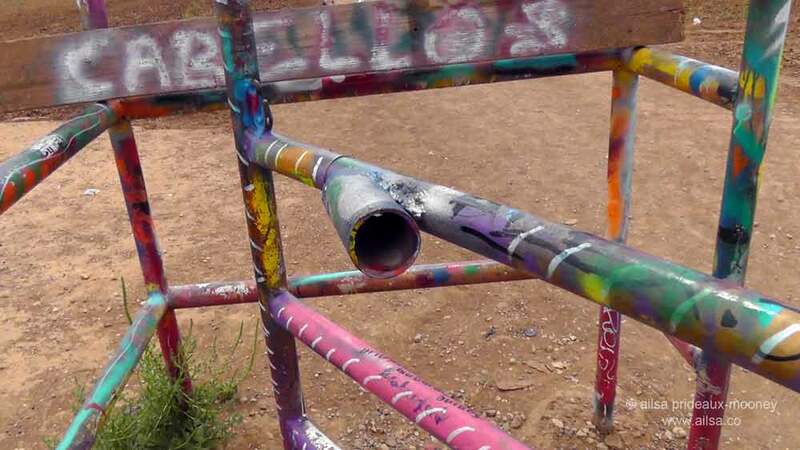 A delicious graffiti-covered turnstile cobbled together out of bits of pipe guards the entrance. 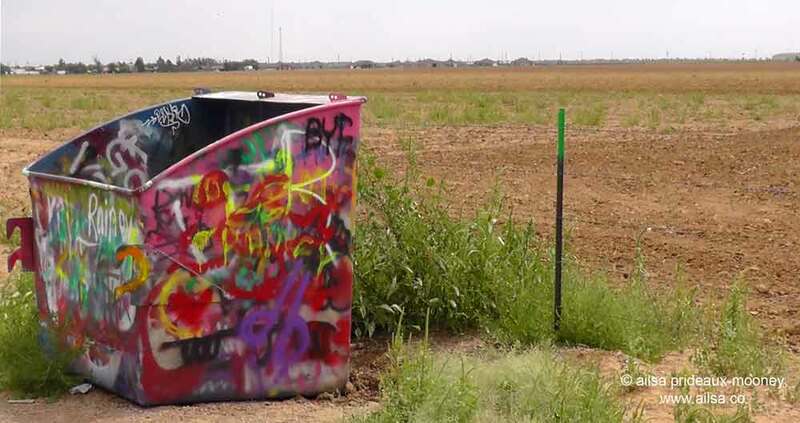 When I visited, even the local dumpster glowed pink, purple, green and yellow with a brand new coat of spray paint. 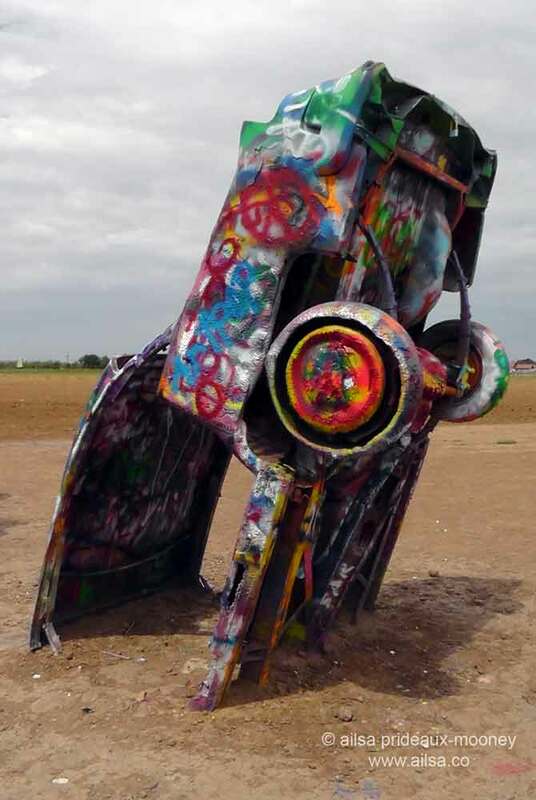 Clambering over the turnstile and traipsing along a dusty path through the pancake-flat Texas Panhandle, I encountered a steady stream of road trippers on their way back out; a vaguely anarchic gleam of satisfaction twinkling in their eyes as we passed and swapped glances. 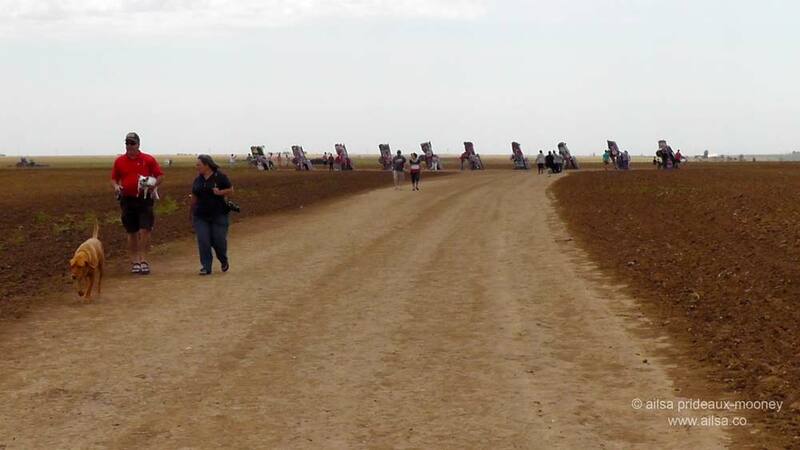 At the end of the dusty trail, ten grand old Cadillacs, once symbols of the American dream, were planted nose first in the ground; all in a row, all at the same depth and angle (purported to be the same angle as the sides of the Pyramids at Giza). The cars were picked up second hand and installed with their original paintwork intact. 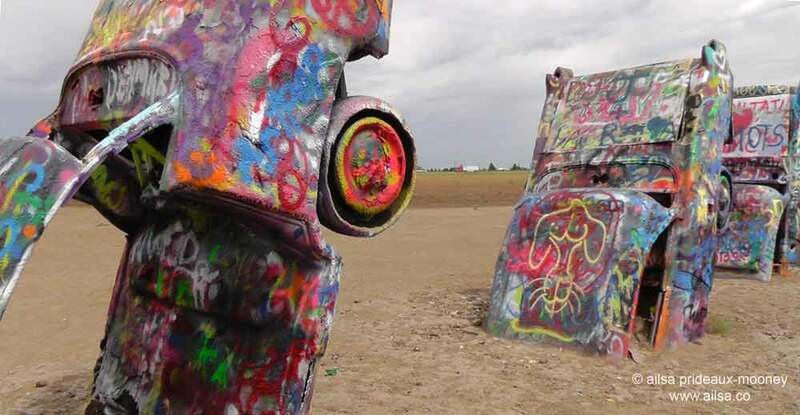 It didn’t take long for visitors to start leaving their own marks on the installation – and this was encouraged by the artists and the local eccentric millionaire Stanley Marsh 3, who paid to commission Cadillac Ranch. 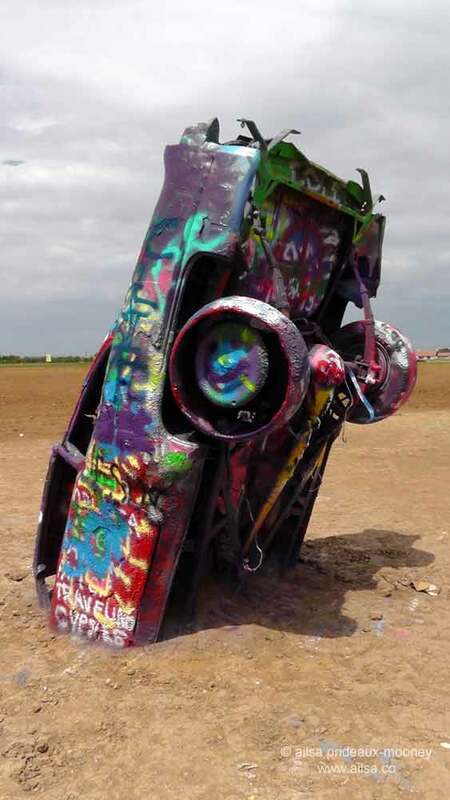 Before long, the cars were stripped down to the shells they are today and ever-changing layers of graffiti adorned every surface. I loved everything about the Cadillacs. I’ve seen photos of the original installation and while the cars looked wonderful back then, there’s something about the way they look today that evokes the incomparable joy and freedom of the open road. The cars never look the same from one day to the next which parallels the ever-changing nature of a road trip. 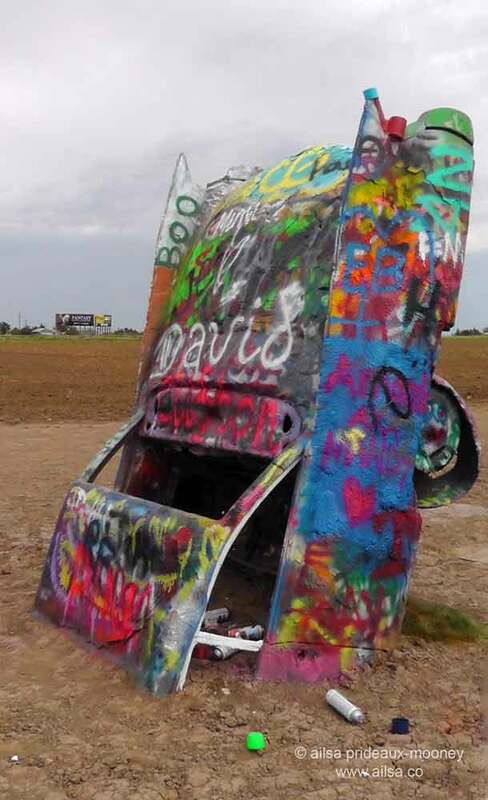 Allowing visitors to leave their own mark, giving them the freedom to express themselves, that is the decadent essence of the all-American road trip. Blazing your own trail, escaping the confines of the homogeneous. The rules are, there are no rules. The fact that the Caddies are half-buried face down in the dirt might put a damper on it for some, but for me, it’s all about the tail fins and they are still reaching for the sky. 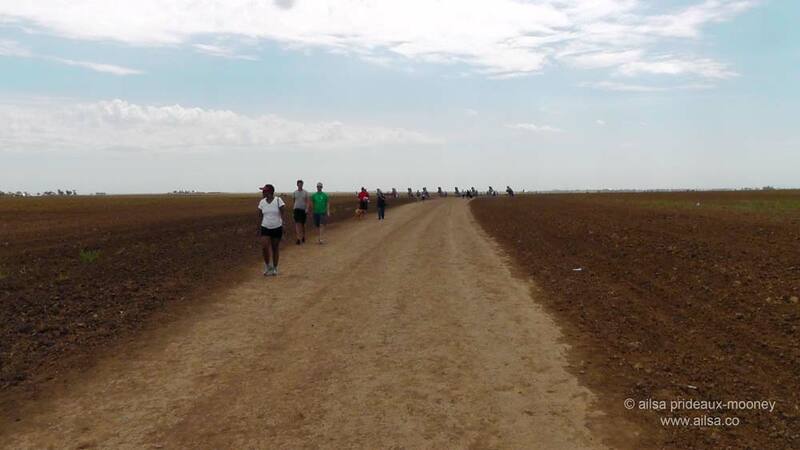 The American Dream may seem half-buried in these complicated times but in the middle of a dusty field out in the Texas Panhandle, hope springs eternal. So throw off your shackles, get your motors running and plan your next road trip. 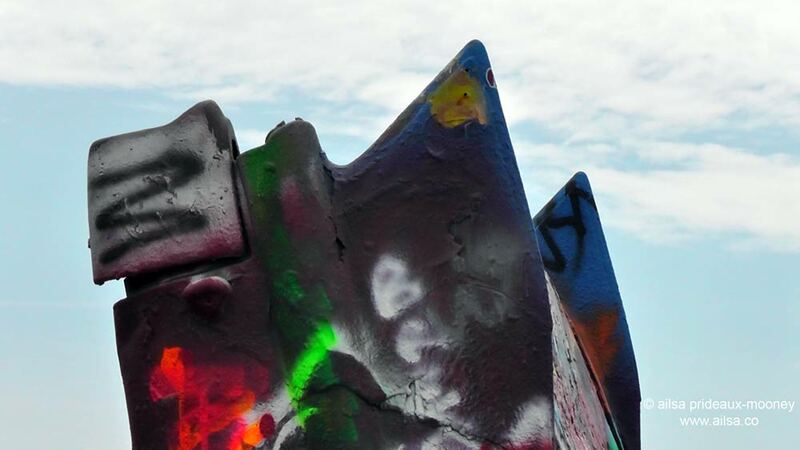 This entry was posted in Photography, Texas, Travel, United States and tagged art, inspiration, photography, photos, pictures, road trip, travel, writing. Bookmark the permalink. Glad you enjoyed it, Sreejith. Apparently, the artists were inspired by a children’s book called “The Look of Cars” which they found in a local bar. Something about the shape of the tail fin captured their imagination and the project was born. 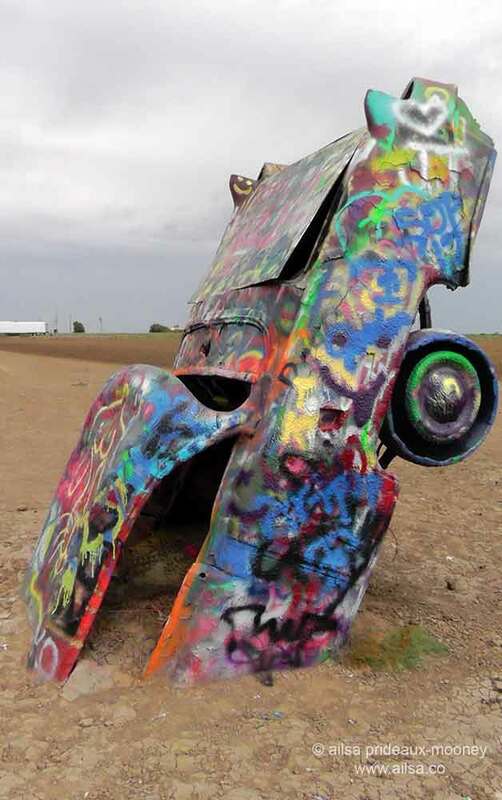 They then went looking for a backer and found a home for the Cadillac Ranch in Amarillo. I’ve seen pictures of this before! But it was un-painted I think. I like the paint jobs! 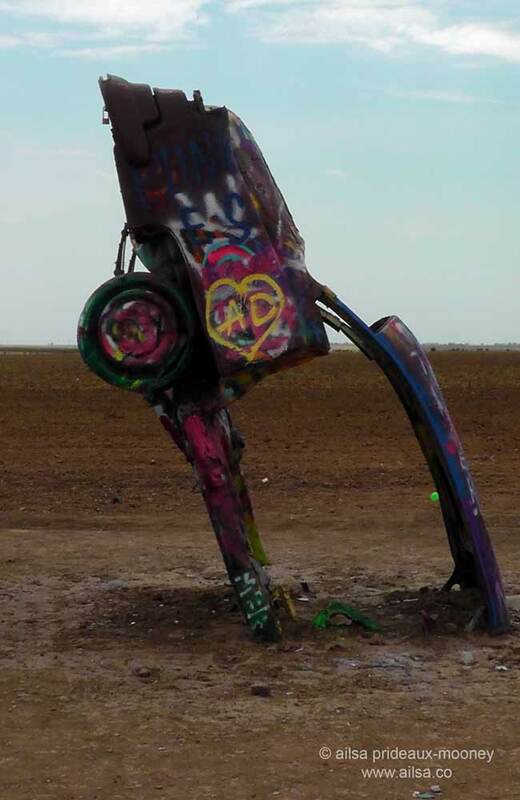 I loved the Cadillac Ranch when I saw it (5 years ago!) My dad had seen it on a previous Route 66 road trip, and so when we did the trip as a family he insisted we should check it out. To know the “E” I sprayed onto one is still there, but hidden as part of its history is a great feeling, and I really hope to see the ranch again! I don’t need much inspiration to plan a road trip and this is more than enough! So interesting. I have heard about this, but I just learned a bit more about it. Thanks. How unusual and creative. What fun! This is so very cool.. I love this.. Fascinating! Sometimes you just don’t know what you’ll find while on the road. And this is a find! Thanks for sharing! I never heard of this spot which is a shame since I crossed Route 66 about 17 years ago. 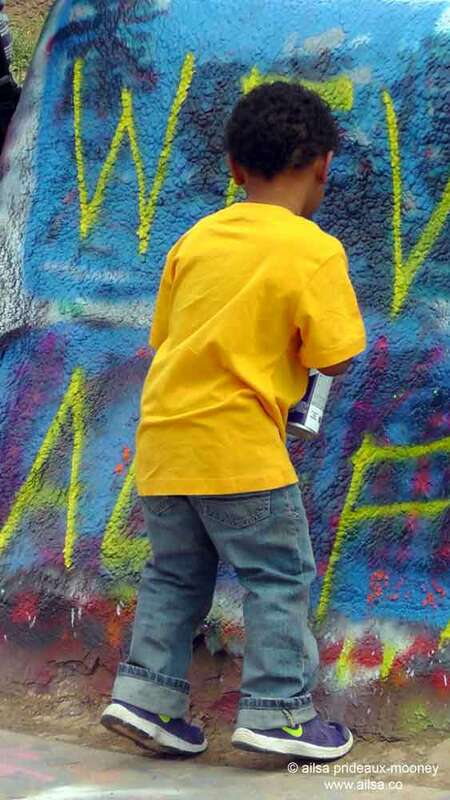 At least I know to bring paint if I cross it again! Nice post. How wonderfully unique! As I continue writing my Sunday Night spot on my blog called “Unique Art”, I am finding more and more artistic creations that blow the mind. These cars would fit the bill as unique art, that is for sure. Thank you for sharing. wow Ailsa! these are wonderful! It is so amazing what you do. I hope I get to do the same one day!